Why Need A Top MP4 Converter? Any Suggestion for Best MP4 Video Converter? MP4, as the most popular video format favored by most people, features a large degree of compression without any noticeable quality loss. It can be played everywhere from mobile devices to desktop computers. 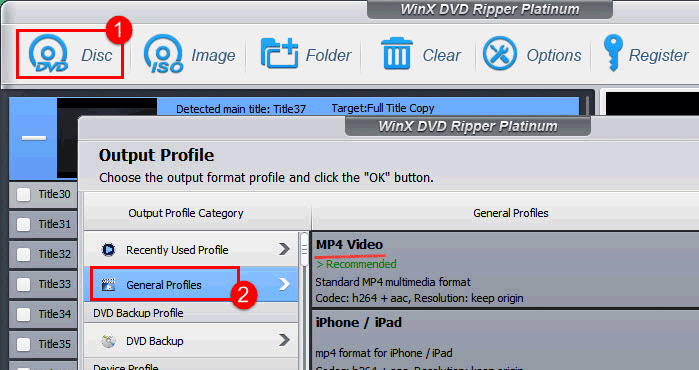 If you have a top MP4 converter at hand, you can convert any MKV/AVI/YouTube video to MP4 on Windows (10) or Mac. 1. MP4 video is highly compressed with a smaller file size while reserving very high video quality. 2. MP4 file is very easy for storing, uploading or sharing. 3. MP4 features the most excellent compatibility. It is a universal format fully compatible with all iPhones/iPads/Android phones and PC/Mac computers, and can be easily played directly on these devices as well as many other media players. 4. Streaming MP4 videos over Internet is such an easy task. WinX HD Video Converter Deluxe - Enable you to convert any video in 8K/4K/1080p/720p HD to MP4 format with original quality, incl. MKV to MP4, AVI to MP4, FLV to MP4, AVCHD/M2TS/MOD to MP4, etc. It also aids you to free download 8K/4K/HD videos/movies from YouTube, Dailymotion, Vimeo and 300+ sites at superfast speed. As the best all-in-one MP4 video converter for Windows (10), it gives you ultimate solution to convert any (YouTube) video to MP4 or to many other video formats/devices. It functions as most powerful video converter to MP4, best online video downloader and converter, photo slideshow maker and video editor. As the best free YouTube downloader for Windows (10), it enables you to free download videos from YouTube and 300+ online video sites and convert them to MP4 at one go at fastest speed. What's more, you can also customize the video audio parameters at your will to get desired MP4 video effects. Compatible OS: Windows 10 (32 & 64 bit), Windows 8 (32 & 64 bit), Windows 7 (32 & 64 bit), Vista (32 & 64 bit), Windows XP/2003/2000, etc. Input formats: All kinds of 8K/4K/HD/SD videos, HD camcorder videos (MKV, AVCHD, M2TS, MOD, etc. ), 300+ website videos, photos and pictures. Output formats: All kinds of 8K/4K/SD/HD videos, 410+ preloaded profiles (iPhone 7/Plus, Galaxy S7, etc), audio and image, 370+ built-in video & audio codecs. 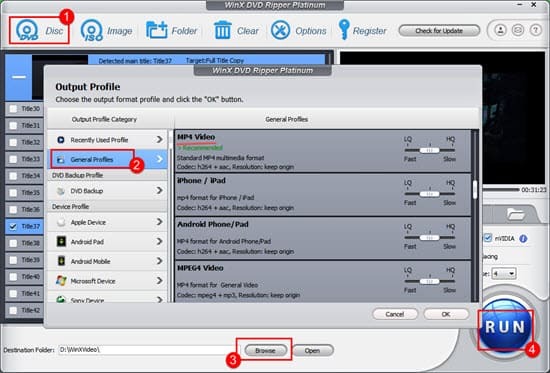 Check WinX HD Video Converter Deluxe supported output formats. MP4 video conversion speed: Support multi-core CPU (up to 8) and Hardware Acceleration tech, delivers a 83x faster real time converting speed. Conversion quality: The built-in High Quality Engine and De-interlacing Engine ensure you lossless output video quality. Editing features: Adjust video/audio parameters, add external subtitles, merge, trim, crop, batch converting, etc. Ease of use: Only need 3 simple steps to finish the conversion process. Besides, its interface is extremely intuitive and simple, so non-experienced users can control this MP4 converter well. This Windows video converter to MP4 can convert various video formats to MP4 and 200+ formats for many devices, also can let you download online videos and music from 100+ sites. Need to mention that its output video quality may be barely satisfactory and the output video sometimes can't be played at all. Input formats: DVDs, CDs, many videos. Output formats: 200+ video formats (not including MOV, VOB, Divx and RM, etc), audio and picture. Conversion speed: 30x conversion speed. Video editing tools: Merge, trim, crop, etc, cannot add watermark. This MP4 video converter can convert between various video file formats. It can convert videos to MP4 for use on many mobile devices. Input formats: 158 formats supported. Only support download MP4 video on Win 7. Output formats: A batch of video formats. Video editing tools: Lack some editing tools. Smooth or not: May shut down easily. WinX HD Video Converter Deluxe - An all-round MP4 video converter for Windows (10) or Mac enables you to convert various videos to MP4 or in reverse with original quality at fastest speed. It also helps you to free download any MP4 video (incl. 2019 new MP4 Hollywood movies) in 8K/4K/HD 1080p/720p from YouTube, Dailymotion, Vimeo and 300+ video sites at superfast speed.